It took just two attempts for Anita Wlodarczyk to produce a mark that was almost three metres farther than any other woman in the world had managed this year. When the world record-holder sent her hammer flying out to 78.52m in round two, the competition for the gold medal was effectively over. From then on, the most enthralling contest was between the Pole and the measuring device. 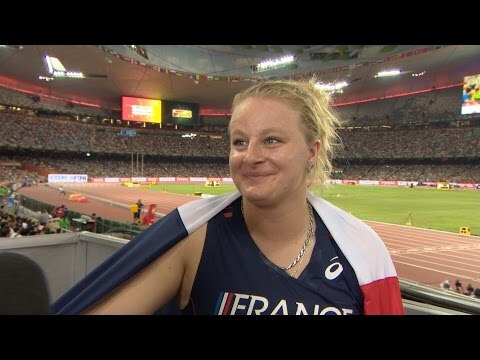 At the start of this month, Wlodarczyk had broken her own world record with 81.08m, becoming the first woman to throw beyond 80 metres. That, combined with her winning streak of 16 competitions coming into Beijing, meant that her confidence was at an all-time high. In the third round, she produced the second-best throw of her career – and her second 80-metre effort – with a championship record of 80.27m. Much to the delight of the home crowd, China’s Zhang Wenxiu was the best of the rest. After opening with 73.47m, she improved to 75.92m in round two to move into second place, overtaking France’s Alexandra Tavernier, who had thrown 74.02m in the first round. Sitting in ninth place before the third round, Britain’s Sophie Hitchon smashed her own national record with 73.65m to move straight into fourth place and qualify for three more throws. After the half-way cut, and with 72.38m needed to make it into the top eight, Zhang improved to 76.33m. It was just the motivation Wlodarczyk needed, and she responded with another throw that landed beyond 80 metres, 80.85m – just 23 centimetres shy of her world record. There were no significant changes in round five, but Wlodarczyk continued her fine series with a throw of 79.31m. Asian record-holder Wang Zheng saved her best for the last round, throwing 73.83m to move into fourth, but that position lasted just a matter of minutes as Hitchon responded with another British record, this time 73.86m, to retake fourth place. Tavernier and Zhang did not improve with their final throws and so remained in third and second respectively. Tavernier matched her country’s best ever placing in the event, following Manuela Montebrun’s bronze medals from 2003 and 2005. After seven consecutive top-five finishes at global championships, Zhang achieved her best ever result by taking silver, one position higher than she achieved at the 2008 Olympics at the Bird’s Nest Stadium. Germany’s Betty Heidler, competing at her 11th successive global championships, was never really a factor. The former world record-holder produced a best of 72.56m in the second round to finish seventh, two places higher than when she last competed at this stadium, at the 2008 Olympics. But this competition belonged to Wlodarczyk. The world record may have eluded her – just – tonight, but she would have been more than happy with winning her second world title with a championship record and two 80-metre throws to boot.